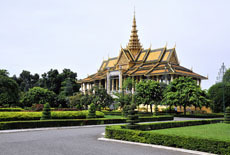 This is the ultimate journey with setting out from the hit capital that is Phnom Penh for impressive National Museum and Silver Pagoda, together a superb shopping in famous Russian market, following a exploration the hill area of Rattanak Kiri where is the one of Cambodia's most secluded and pretty provinces and home to a diverse mosaic of ethnic people. Heading back to Mekong at Kratie for an encounter with elusive Irrawaddy river dolphins. On the way to Siem Reap, stop at Kampong Thom to visit Sambor Prei Kuk considerated as Cambodia's most impressive group of pre-Angkorian monuments. 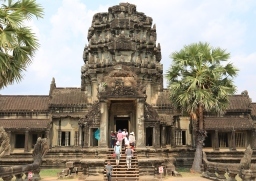 With four days to discover Siem Reap, it is possible to see most of the important sites that are national simple Angkor Wat, significant Angkor Thom, many fascinating temples of Petit Circuit and Grand Circuit, the jewel in the crown if Angkorian artisanship Banteay Srei, and taking excursion boat trip in Tonle Sap. 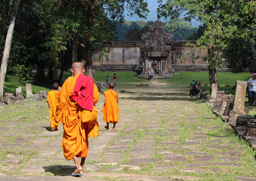 Travelling to Cambodia to explore the real treasure of the humankind! vcOur guide and coach will wait and pick up at Phnom Penh International Airport then check in hotel. 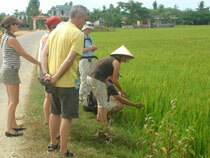 After, transfer to visit Royal Palace, Silver Pagoda, National Museum, Toul Sleng Genocide Museum and Russian Market. Overnight at the hotel in Phnom Penh. Breakfast at hotel. Transfer by road to Kampong Cham province via national road No. 7 which take 2h30mn. Afternoon, visit Wat Nokor Bachey and Phnom Pros and Phnom Srey. After, visit the colonial architecture of Cambodia's third city. 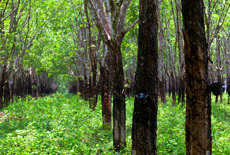 Lastly, visit Chup Rubber Plantation. Overnight at the hotel in Kampong Cham. After breakfast, we continue overland to Rattanak Kiri Province. Around 10km far before reaching provincial town Banlung, we take chance to visit Teun Village which is the Kreung tribes minority village. Arrival Banlung and transfer to check in at hotel. After taking a short rest, we visit to Yeak Laom Lake - the former volcanic eruption with 50m depth where we can relax, swim and enjoy a panoramic view. Overnight at the hotel in Rattanak Kiri. Our direction today is northwest. We cross bamboo forests before reaching the village of Veurn Saï located on the left bank of the Sé San River ; the view on the Chinese village on the other side of the river is quite pretty. Besides, this place is nearly a Chinese enclave in Cambodian territory. 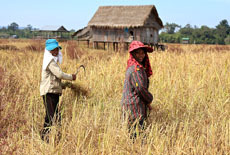 Most villagers there, don’t even speak Khmer. Upstream of the Se San are a certain number of Tampoun villages that practice funeral statuary. If it is possible, we will rent a boat to go to the village of Ka Choan that has superb totems, if not we will reach there by 4x4 vehicle. Back to the town and overnight in Banlung. Breakfast and drive back to Kratie Province around 260km distance. Arrival Kratie town at afternoon. Check in at the hotel and take a short rest. After, transfer to visit Wat Sorsor Muoy Roy (100 column-pagoda) which was built in Chenla era. Lastly, return to visit rare Irrawaddy Dolphie - the world endanger fresh water mammal at Kampi and enjoy sunset there. Back to hotel and overnight in Kratie. After breakfast, continue by road to Kampong Thom Province around 270km to reach. Arrival provincial town at afternoon time. Check in at hotel. After, continue exploring Sambo Prey Kuk Complex, the ancient capital of Chenla which was built in 7th century. Overnight at the hotel in Kampong Thom. After breakfast, transfer to Siem Reap Province which take time about 2:30 hours more. On the way, visit the ancient bridge - Kampong Kdei. Continue road to Siem Reap. Upon arrival, check in hotel. Afternoon, start exploring the World Wonder 'Angkor Wat temple" and enjoy sunset view from a top of Bakheng Hill. Back to the hotel. Overnight at hotel in Siem Reap. Breakfast and continue visit Banteay Srei temple which is 38km from town. Then, back to visit Banteay Samre temple. Afternoon, transfer to visit Grand Circuit including Preah Khan, Neak Pean, Pre Rup, Ta Som, and East Mebon, then back to hotel. Overnight at the hotel in Siem Reap. Morning after breakfast, you will transfer to enjoy with traditional wooden boat on Tonle Sap Lake for 1hour by visit the daily life of floating villagers. On the way back, we enjoy with oxen-cart riding at Aranh Village. 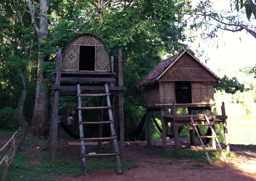 Back to visit Chantie Ecole-Artisan D'Angkor and shopping at Old Market before transfer to the airport for flight off. End of service. Other services not mentioned in the "Included"
Phnom Penh is a city of amazing architecture stamped with diverse influences, mainly French. Phnom Penh also makes a perfect base for many fantastic discoveries to surrounding areas. Ratanakiri province, also called "Rotanah Kiri", is a northern province of the country. This is the "land of red soil"...Because of the region isolation, Ratanakiri is one of the least developed regions of Cambodia. The facilities are very limited and so is the power of local government. 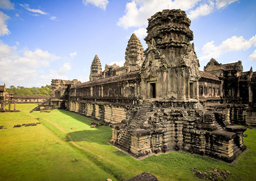 Siem Reap is the capital of a province bearing the same name in northwest Cambodia. 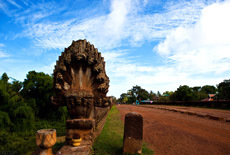 Located 300 km north of Phnom Penh, Siem Reap becomes a gateway to the Angkor region. Siem Reap is alluring huge crowd for its Angkor Temples (Buddhist Pagodas or Wats) around 7 km away from downtown. Siem Reap means the “Defeat of Siam” and refers to the centuries-old conflict between the Siam (now Thailand) and Khmer people. 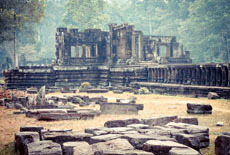 The famous archaeological site of Angkor is located 7 km from Siem Reap downtown. This monumental complex comprises more than a hundred temples, palaces and pagodas built between the ninth and fourteenth century during the reign of King Suryavarman II. 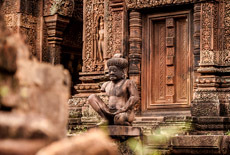 Siem Reap means "Siam Defeated" and refers to the 16th-century victory that solidified the Khmer kingdom. 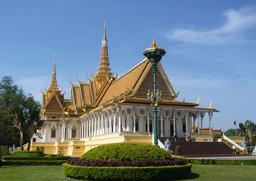 CCT05 - Cambodia Highlights, 6 Days - Ab US$382 /Pers.